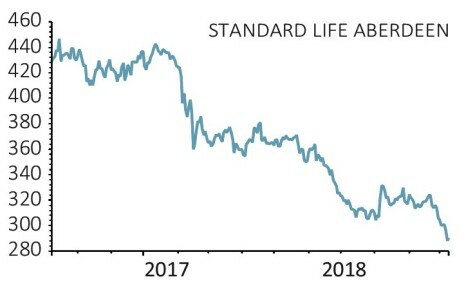 Despite three quarters of the analysts which follow it liking the stock, Standard Life Aberdeen (SLA) shares are down more than 30% this year hitting recent lows below 290p. It certainly hasn’t been plain sailing for the venerable Edinburgh firm since its tie-up with Aberdeen Asset Management in 2017 and investors should resist the temptation to see current weakness as a buying opportunity. In February 2018 the shares slumped 14% after one of Aberdeen’s biggest customers, Scottish Widows, terminated a contract on the basis that Standard Life was a material competitor. Widows had £109bn of assets at Aberdeen. The shares took another tumble in June when Lloyds Banking (LLOY), which owns Scottish Widows, announced that it had dumped its entire stake in SLA. Lloyds is now in talks to merge its wealth management arm into a new joint venture with Schroders (SDR) with the latter expected to win the Widows mandate. Standard Life's assets under management and administration (AUMA) are still above £600bn but first half results showed net outflows of £16.6bn, mostly from higher-margin equity products like Standard Life Global Absolute Return Strategy (B7K3T22). That translated directly into a 7% fall in operating profits. The GARS fund, seen as a ‘hedge fund for the masses’, was the biggest in the UK in 2016 with assets of almost £27bn. However due to poor performance and outflows, assets have since dwindled to £17bn. 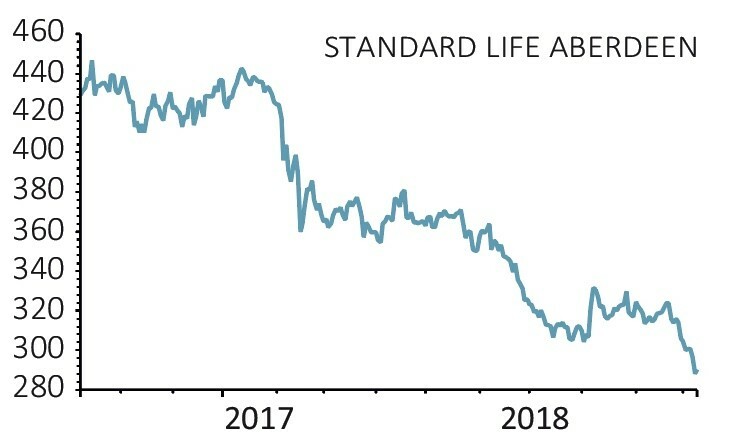 Standard Life is also caught in a ‘race to the bottom’ as industry rivals cut fees to try to grab a bigger share of customer assets. Firms like Vanguard and Fidelity have offered low-cost index funds for years. Now Fidelity has launched a range of zero-fee index products with the first two funds capturing over $1bn of assets within a month of launching. Added to these competitive pressures Standard Life's bent towards emerging markets, which have suffered from bearish sentiment all year, hasn’t helped its share price. On the plus side the company is shedding its UK and European insurance businesses as it adopts an ‘asset-light’ model. That will allow it to return up to £1.75bn of capital or nearly 20% of its current market cap to shareholders. There is also a renewed focus on costs to try to offset the impact of lower revenues and protect profits, and this looks to be bearing fruit as first half pre-tax profits were up on the previous half.